Joined in 1994 aged 13 after showing promise at school sports. She immediately showed promise in the sprint events and also took to the high jump being selected for Avon at the English Schools Championships in Nottingham 1995. Joanna added another string to her event bow by taking up hurdling in 1996. The extra skill also enabled Jo to make an impact in Combined Events although her Javelin and 800m abilities weren’t quite to the all round athlete standard. 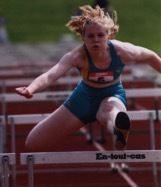 In 1996 she again represented Avon at English Schools Championships in Sheffield this time in 80m hurdles. After concentrating her training more towards hurdling with coach Graham Howell, Joanna was quickly making an impact. 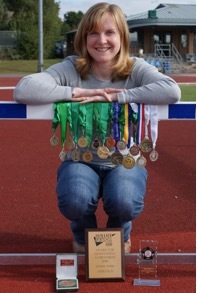 In 1998 she had a fantastic year as a first year U20 in the 100m Hurdles when she took the Midland Counties U20 Silver Medal, made the Senior Girls Final at the English Schools Championships in Exeter and was ranked 17 Nationally at the end of the season. Disaster struck though at the end of that season when a persistent niggly back pain became worse. Many medical experts failed to identify the problem which wrecked Jo’s ability to train or compete consistently for 5 years. The problem was thought to be fractured vertebra but was never satisfactorily diagnosed. Jo made a concerted effort to return to hurdling in 2004 and achieved a 100mH best of 14.42s to take a Silver Medal at the Midland Senior Champs. In 2005 despite the continuing disruption to training and competition Jo again improved her 100mH time to 14.26s at the Loughborough International, and recorded a series of good performances at the AAA’s Champs, Inter Counties and Midland Counties where she became Midland Champion. Continuing her good form into the 2005/6 indoor season she competed at the AAA’s champs and took a gold medal at the Birmingham Games with a new 60mH club record and a Silver Medal in the Midland Champs. Jo continued pressing to improve her performances and sustained good national ranking and being invited to AAA’s senior indoor again in 2008 and outdoor again in 2009, lining up with the best in the country over 100m Hurdles. Jo’s strong club loyalty and support for the teams couldn’t be faulted , leading by example in the 2009 Midland League she scored most points across the season of all the club athletes. After a strong and competitive 2009 season where she was again at her best and pressed desperately to take the club record she decided that she would ease down from top flight athletics in order to start a family but maintaining a reduced training program.